Enjoy a scenic helicopter flight on board an EC-130 over the Grand Canyon and a Champagne picnic 3,200 feet (960 meters) below the canyon rim. 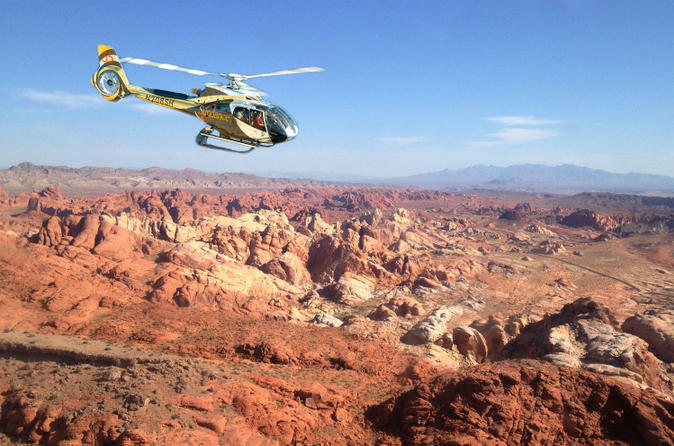 This popular half-day VIP tour showcases the best of Mother Nature’s natural beauty and includes soaring over the stunning Valley of Fire with an expert local guide. A mid-day touch down insures plenty of time for afternoon exploring on the streets of Las Vegas, too. A luxurious experience from start to finish with limo transfers, a Champagne picnic in the Grand Canyon, extended flight time through the Valley of Fire and photograph, and Grand Canyon movie keepsakes. Your Grand Canyon West Rim and Valley of Fire helicopter tour showcases the best of this American natural wonder. Hover below the canyon walls, and see a part of this southwestern beauty that’s accessible only by helicopter. Enjoy the luxury of a Champagne picnic lunch while you gaze out over the picturesque Colorado River. Your professional pilot will take you along the Canyon Rim, through the Valley of Fire and end with an incredible view of the glittering Las Vegas Strip. A private limousine will meet you upon touch down for the return trip to your hotel. A DVD and souvenir photo are included in this package. There is a maximum capacity of six people per helicopter plus your pilot. All flights are operated by an EC-130 helicopter.